ASX-listed Scentre Group runs and operates over 40 Westfield shopping centres in Australia and New Zealand, hiring over 600 staff per year. Afroditi Sebastian, Organisation Development Consultant, found the company's new hires were subject to highly inconsistent onboarding experiences. This was partly due to the geographic spread of the group's operations, which meant that new hires in NSW got face-to-face induction days at their support office, while new staff in other states and regions were onboarded individually by regional or local managers. The reliance on managers to arrange the onboarding experience was taking its toll on new hires. Scentre Group knew they needed to support their managers to improve the onboarding experience. Being in retail, Scentre Group typically hire over 200 casual staff over the Christmas period which exacerbated these issues further. Scentre Group brought on Enboarder to manage the entire onboarding process and communications with managers, new hires and other business stakeholders. They also integrate Enboarder with PeopleSoft, their HRIS, so as to automate kick off the onboarding experience as soon as a new hire signs their contract. Scentre Group also kicked off pre-boarding for the first time. “Prior to day one, we now communicate with new hires to get them excited and ready to hit the ground running! We never used to communicate with new employees before their start date. Now we communicate at least 2.5 weeks before. This means we can introduce them to who we are as a company and get to know a little more about them before they arrive, get them excited about our values and purpose and help them feel less anxious about day one." Realising just how important the day one experience was, they even decided to have dedicated Regional Induction Champions to own the experience in their respective regions. “We also made someone in each region an ‘induction champ’. Their role is to coordinate the ‘day one experience’ which involves an educational centre tour that goes over new developments, and teaches them how different parts of the business contribute to the day to day runnings of the business. On this day we also hold an informal breakfast with a host and we invite their managers and other new starters to attend. This helps them build a network of new starters to befriend. Then finally we give new starters a gift card and let them finish early to do as they wish." Scentre Group have completely revamped their employee onboarding experience. They are now undertaking provisioning tasks on a just-in-time basis, and delivering the appropriate content during the moments that matter. Scentre Group can now be certain that all their managers are fully prepared and engaged in the onboarding process. 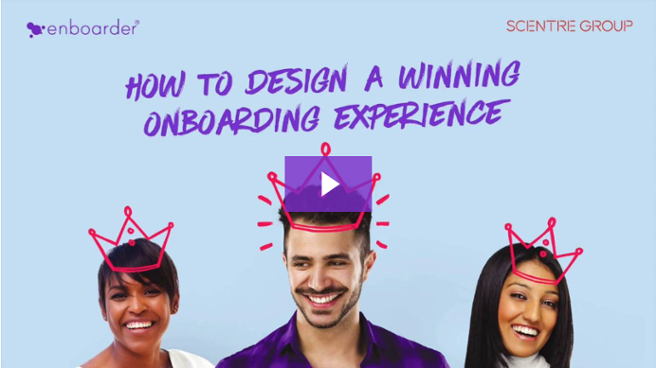 Scentre Group and Enboarder presented a webinar How to Design a Winning Employee Onboarding Experience, which talks about how they revolutionised the onboarding process.